Ivory Coast's Africa Cup of Nations qualifier at home to Sierra Leone is in doubt because of a ban on international sports events in the country. 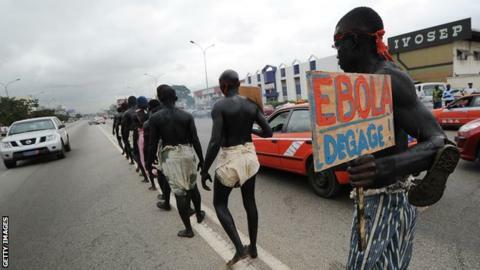 The Ivorian Ministry of Health and Ministry Of Sport made the decision on Tuesday because of fears over Ebola. Ivory Coast are due to host Sierra Leone on 6 September in Abidjan - their opening qualifying match in Group D.
The sport and health ministers and the football federation are meeting on Wednesday to discuss the issue. There have been no reported cases of Ebola in Ivory Coast, but the outbreak started in neighbouring Guinea and spread to Liberia, Sierra Leone and Nigeria. It is not clear whether Ivory Coast will still be able to play the match or if they will have to find a neutral venue or forfeit the fixture. The Confederation of African Football has indicated it will be guided by the World Health Organisation's stance over the Ebola crisis; it "does not recommend a ban on travel to and from affected countries". That could mean Ivory Coast may face sanctions should they fail to fulfil the fixture.